Players Can Journey to Outer Space as Guardians of the Galaxy and Battle the Inter-Dimensional Beast Abilisk. 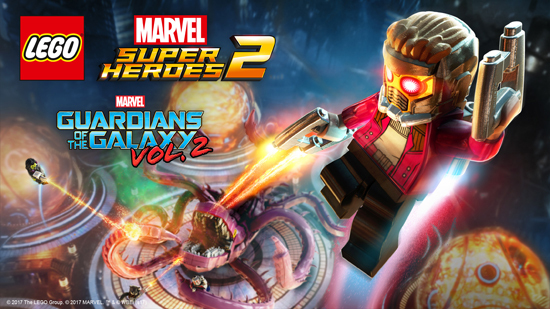 A new downloadable content pack for LEGO Marvel Super Heroes 2 featuring a level and characters inspired by Marvel Studios’ Guardians of the Galaxy Vol. 2. The pack includes a thrilling new level, inspired by the unforgettable opening scene of the movie, where players battle a giant alien monster known as the Abilisk. The pack also adds playable characters Star-Lord (variant), Kraglin, Stakar Ogord, Tullk, Rocket (Ravager variant), and Ego, letting players utilise their unique special abilities as they face off against the diabolical, inter-dimensional creature. The Guardians of the Galaxy Vol. 2 pack can be purchased separately or as part of the Season Pass which includes six Level Packs and four Character Packs. The Season Pass is available for £11.99 or as part of the LEGO Marvel Super Heroes 2 Deluxe Edition.